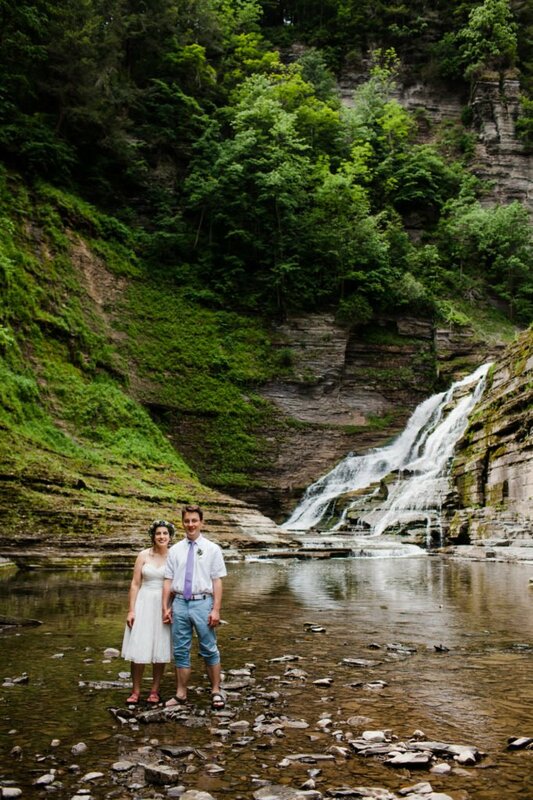 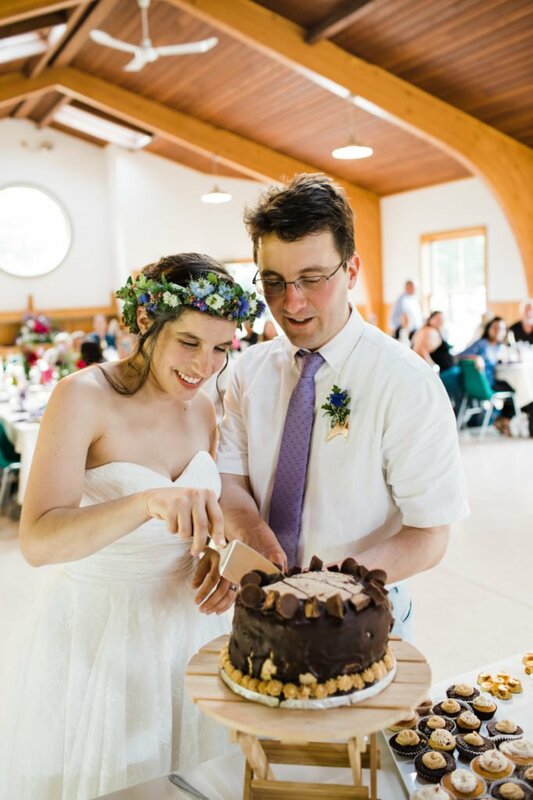 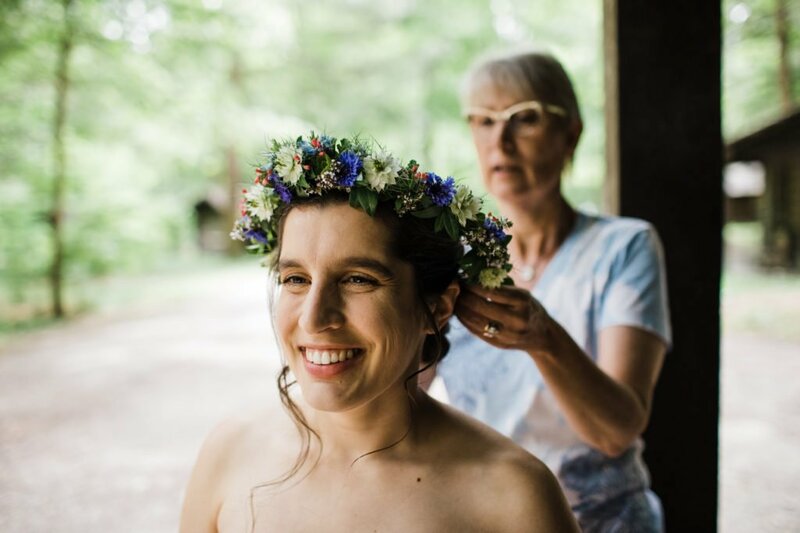 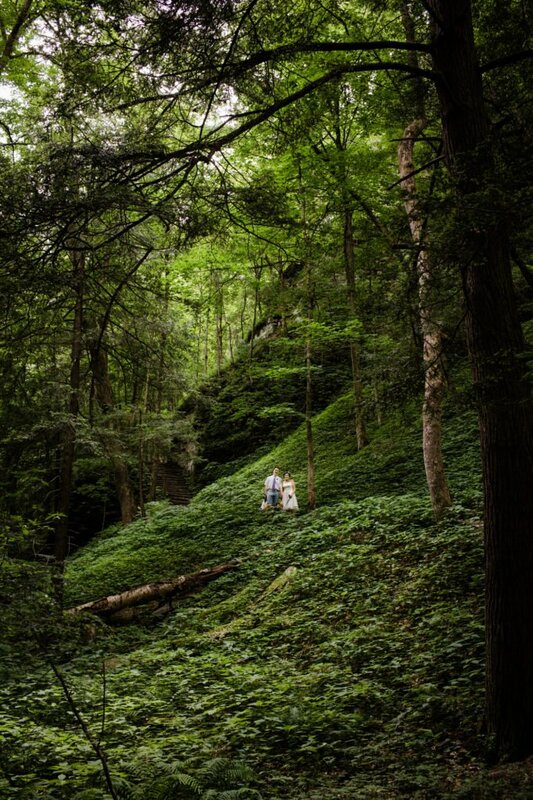 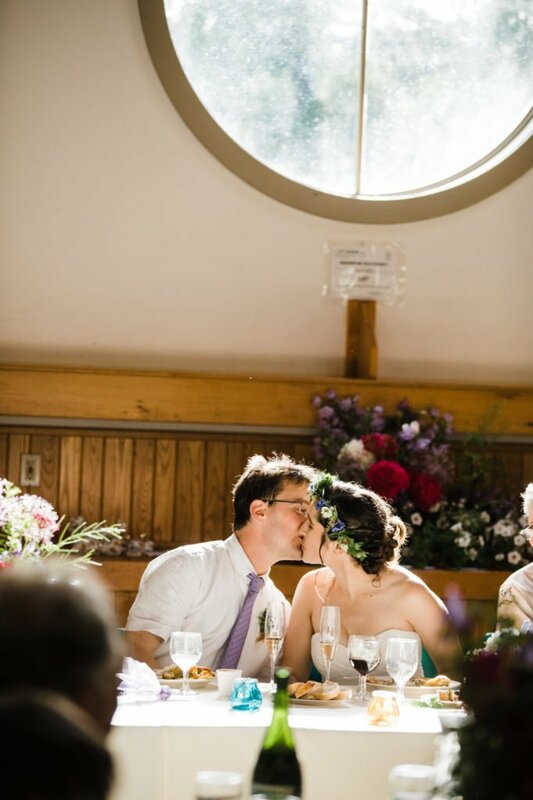 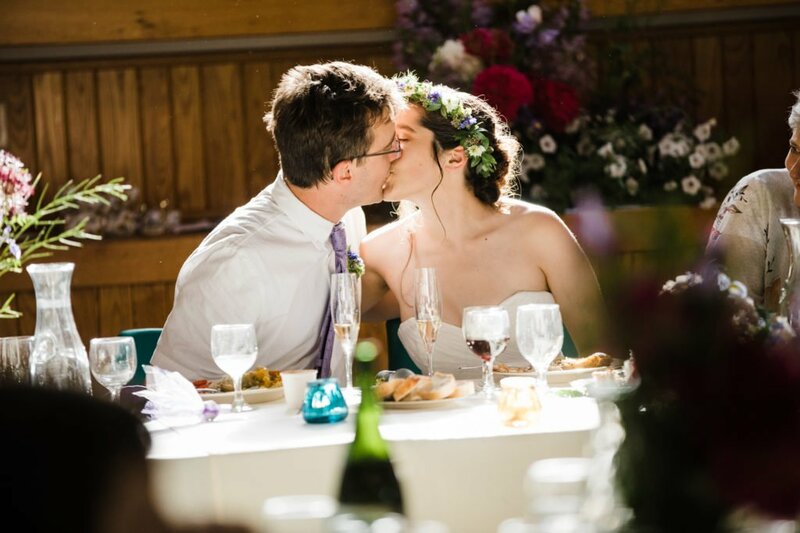 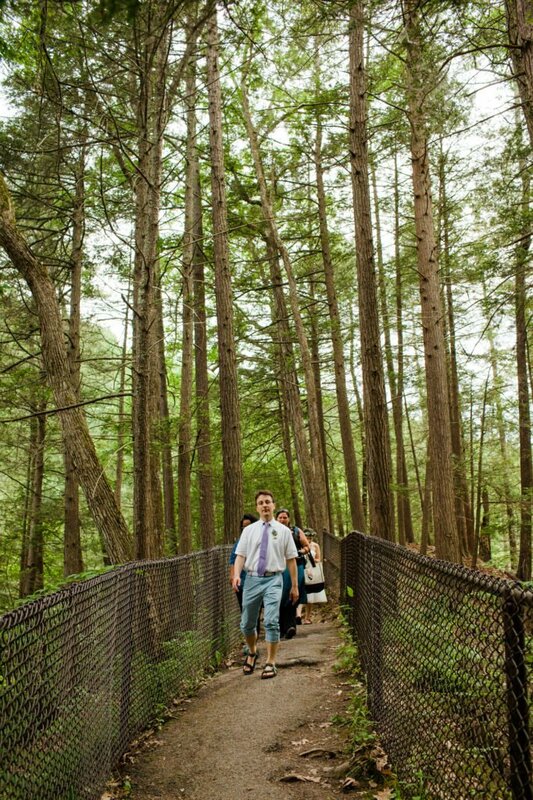 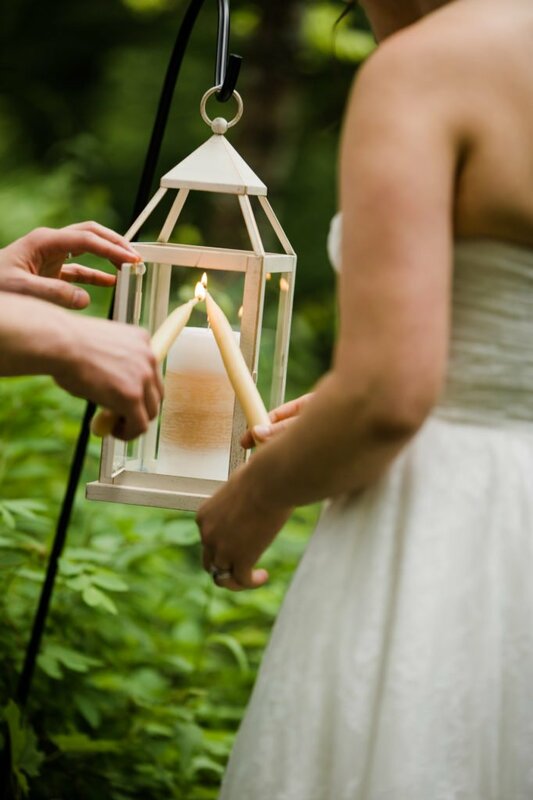 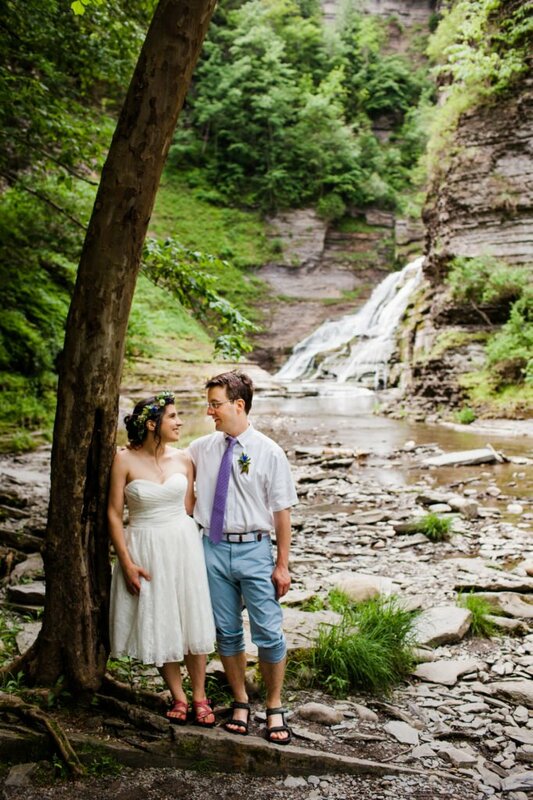 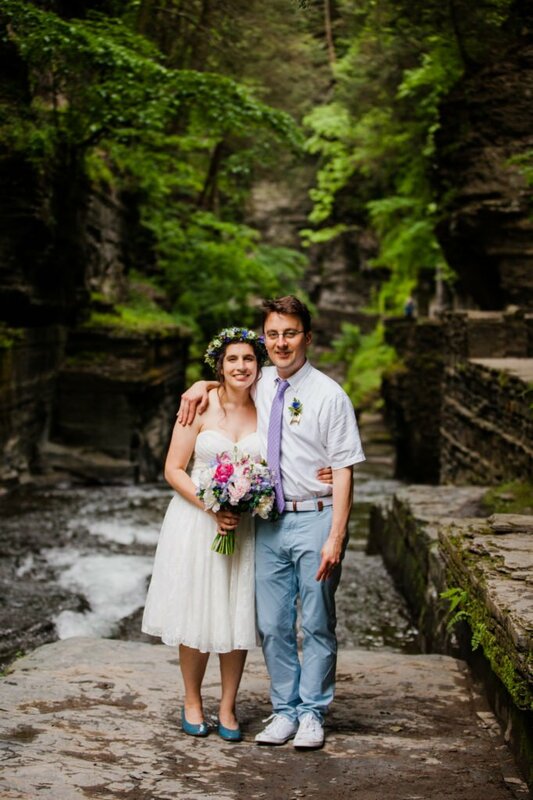 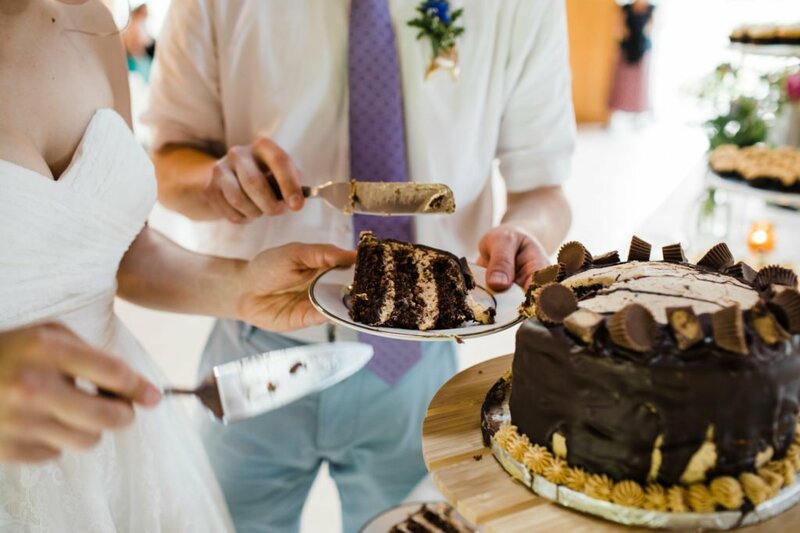 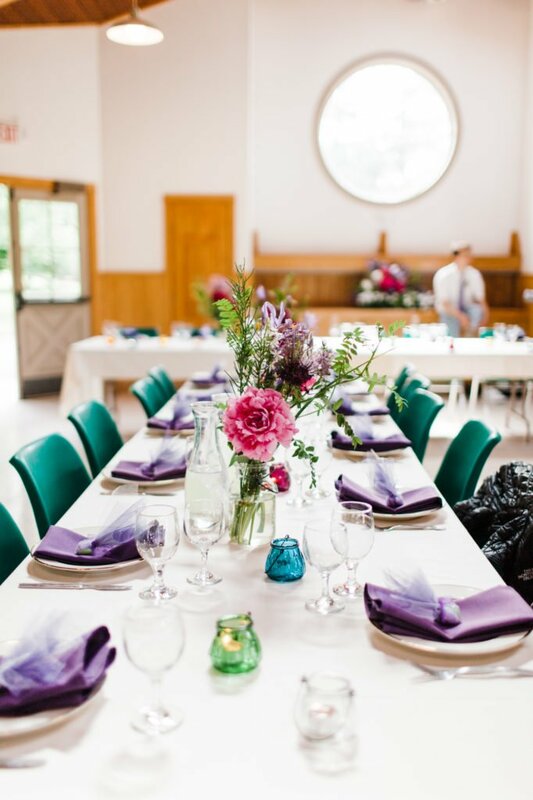 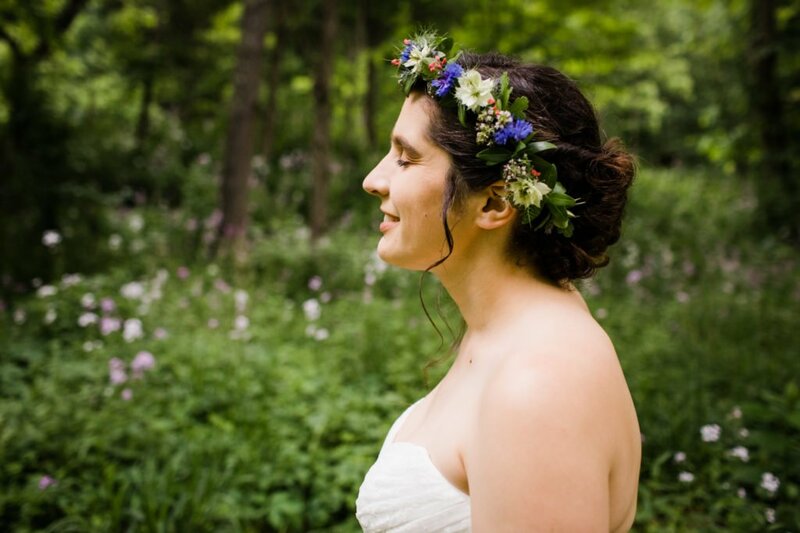 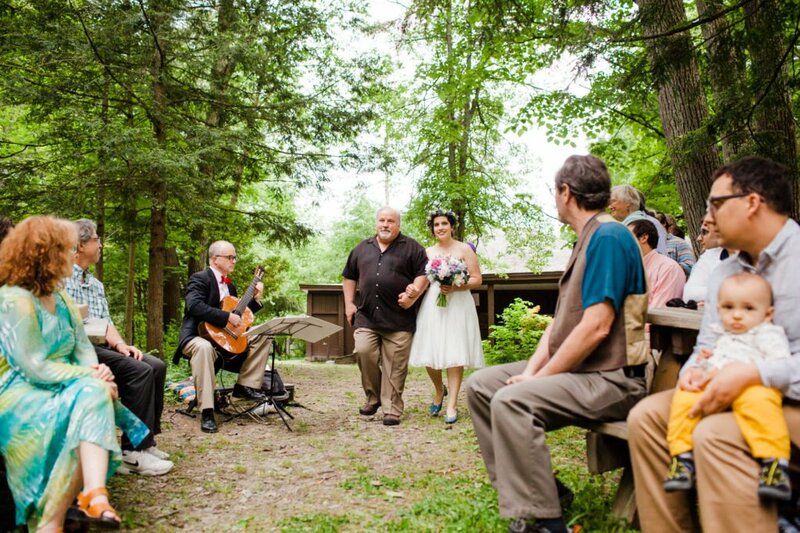 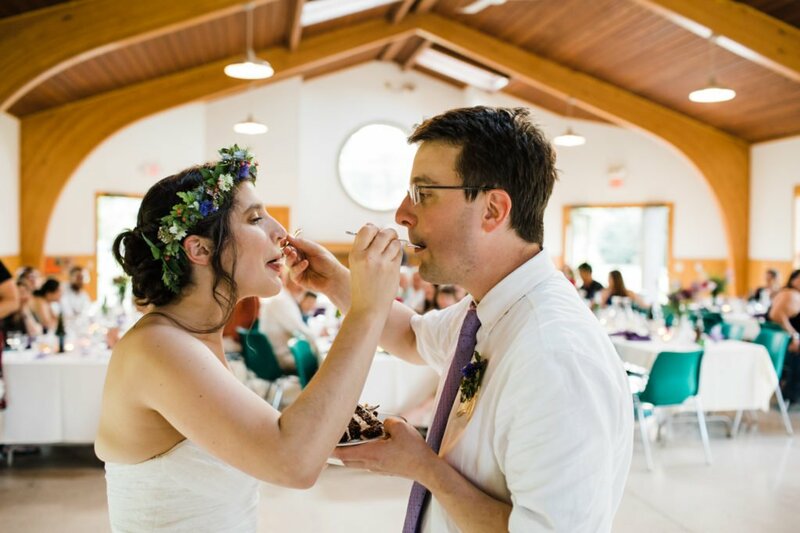 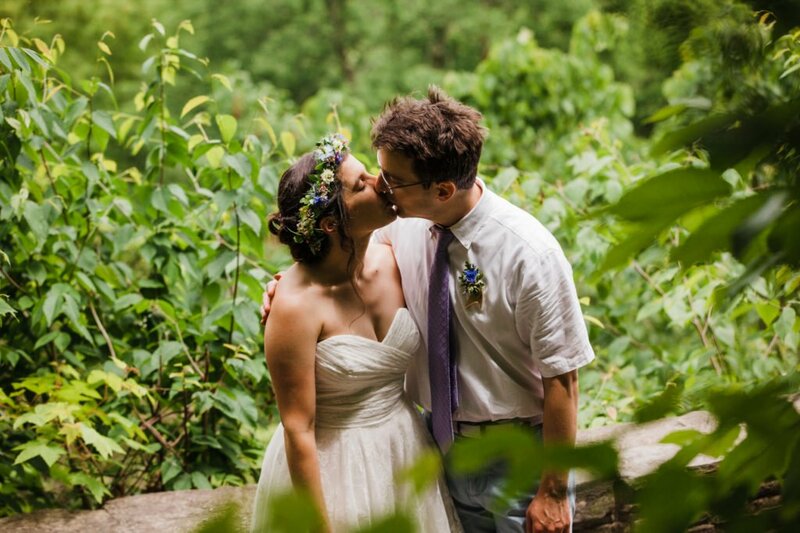 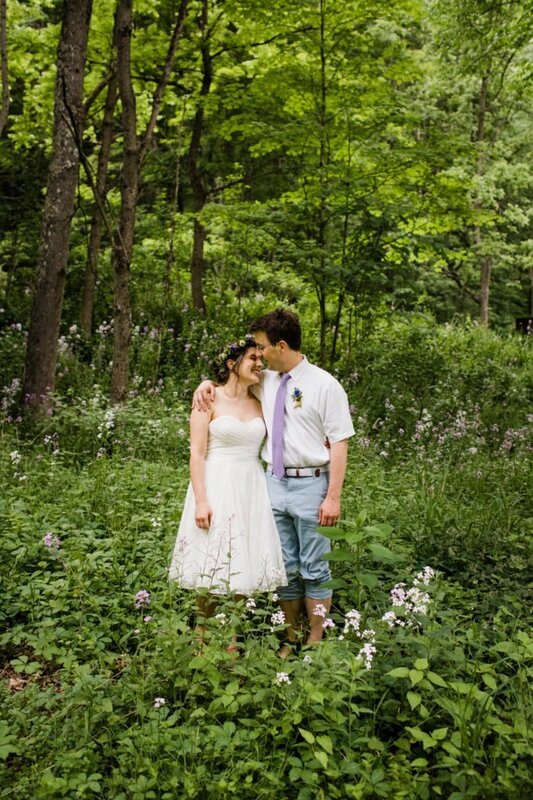 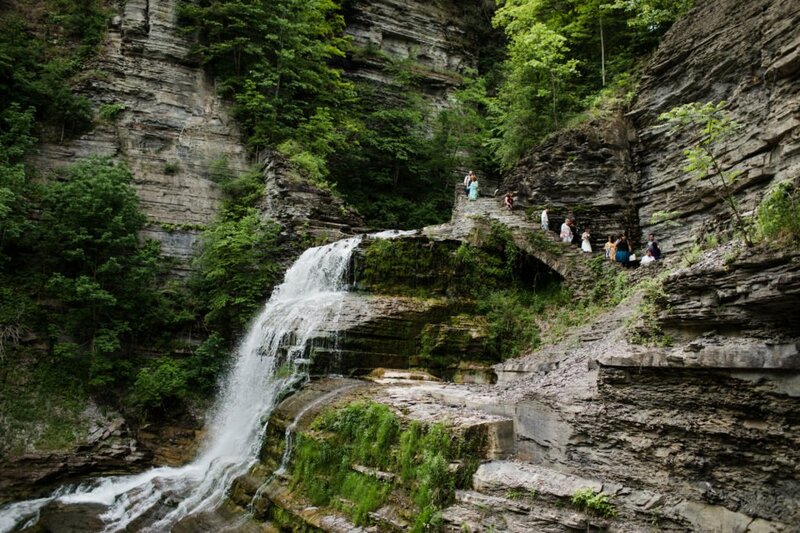 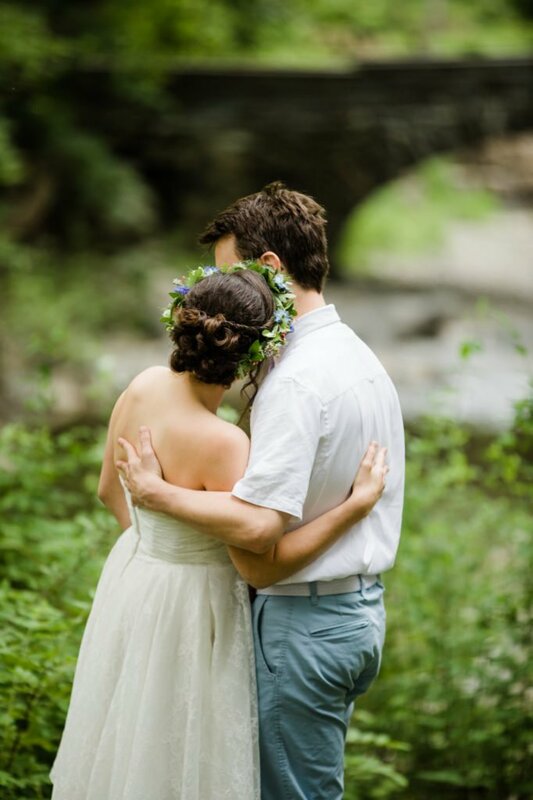 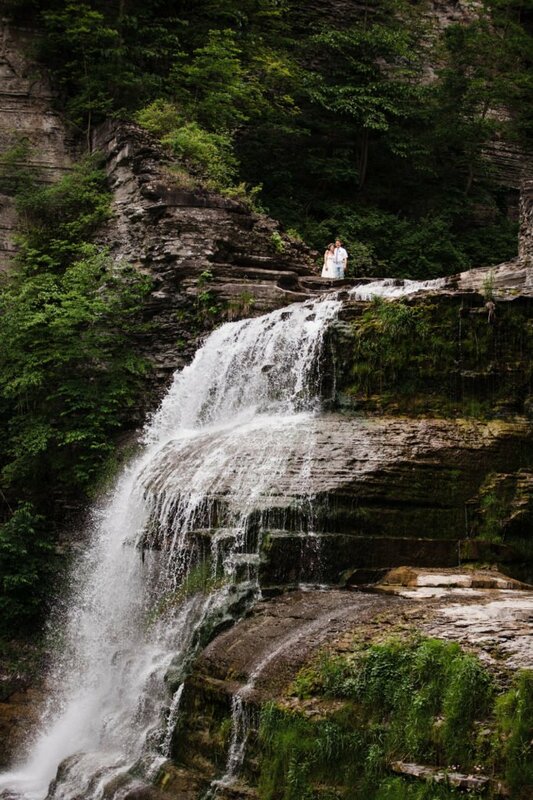 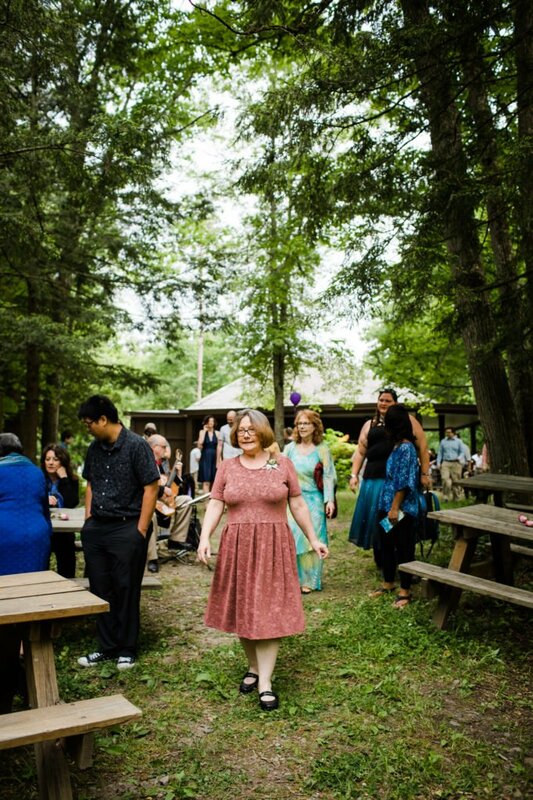 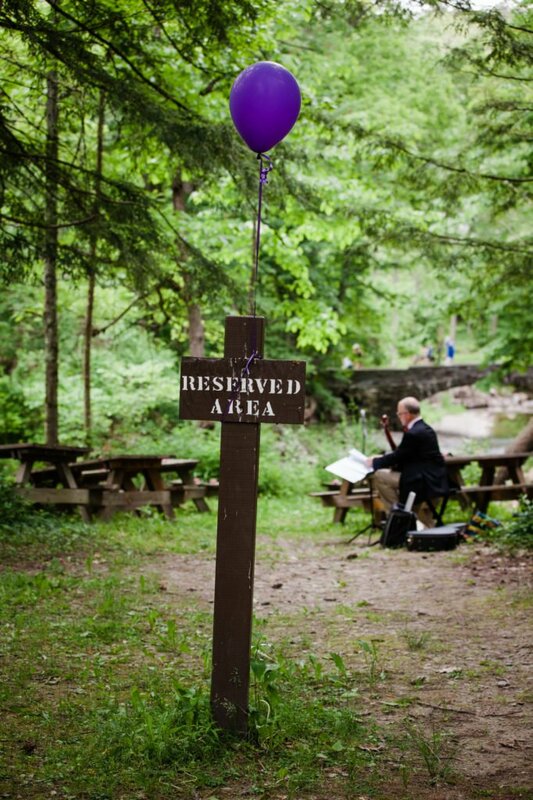 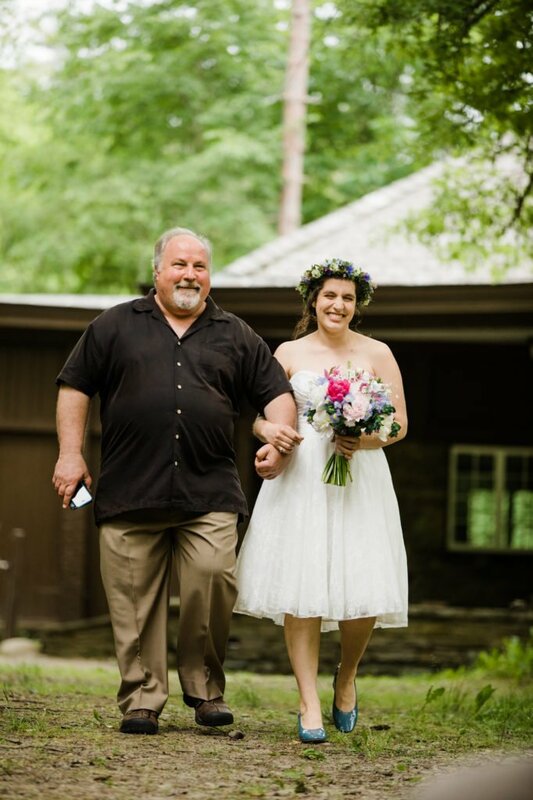 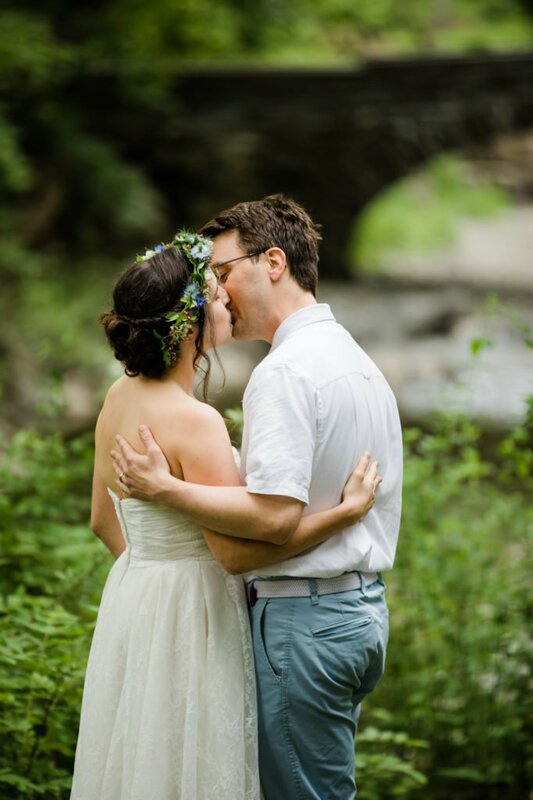 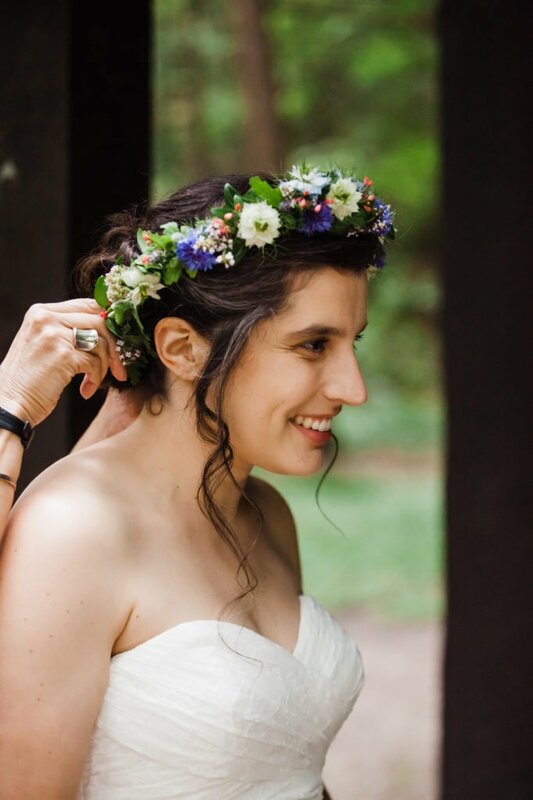 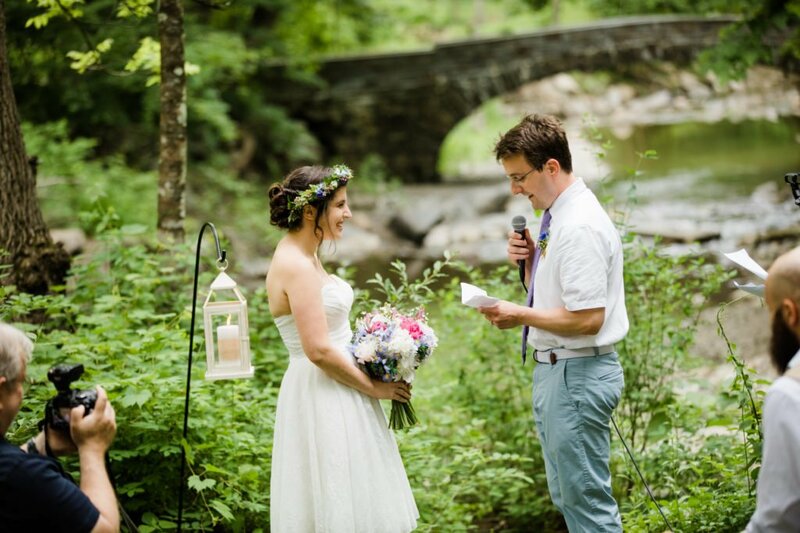 Emily & Matt’s wedding at Treman State Park was so beautiful and relaxed. 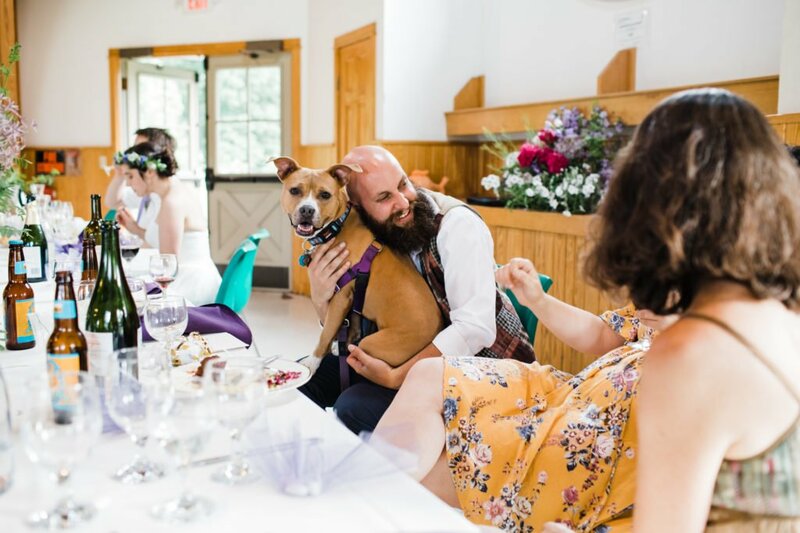 With less than 80 guests, it felt intimate but energetic, and the 5 doggos present just added to the fun with surprisingly little chaos. 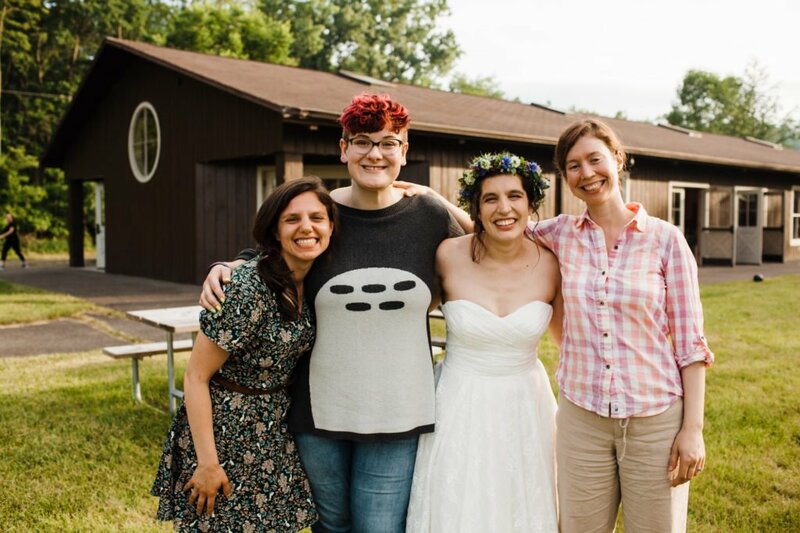 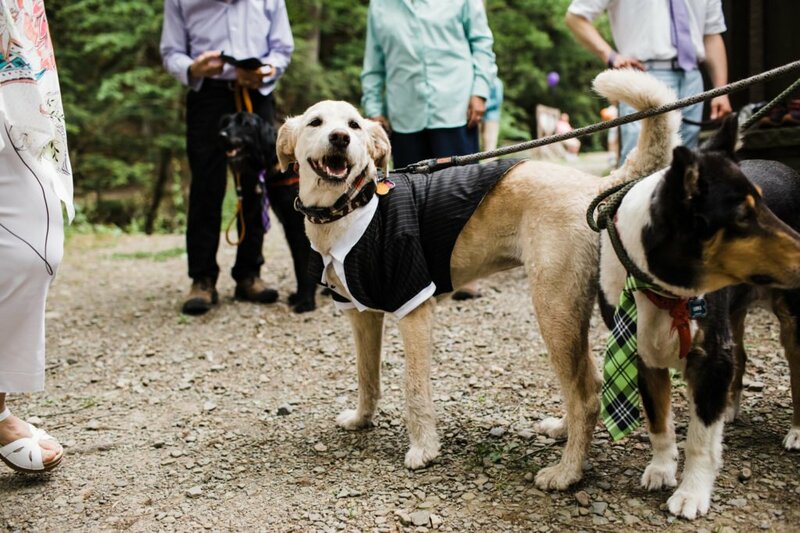 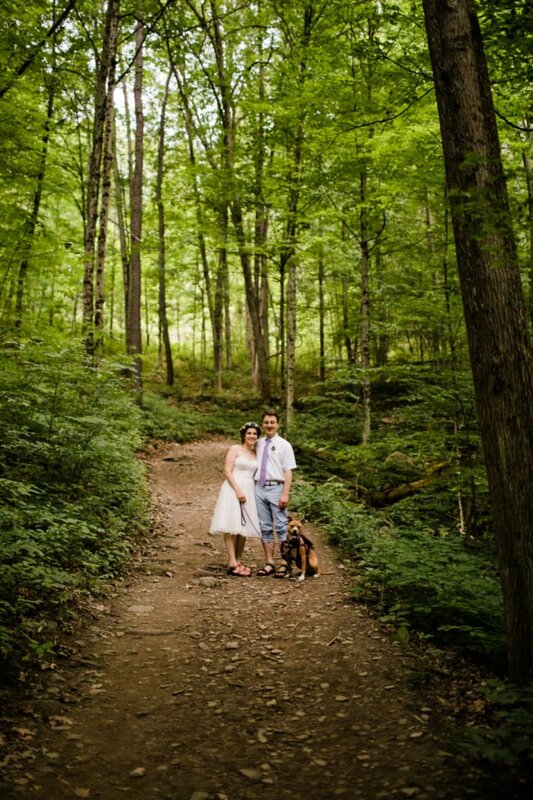 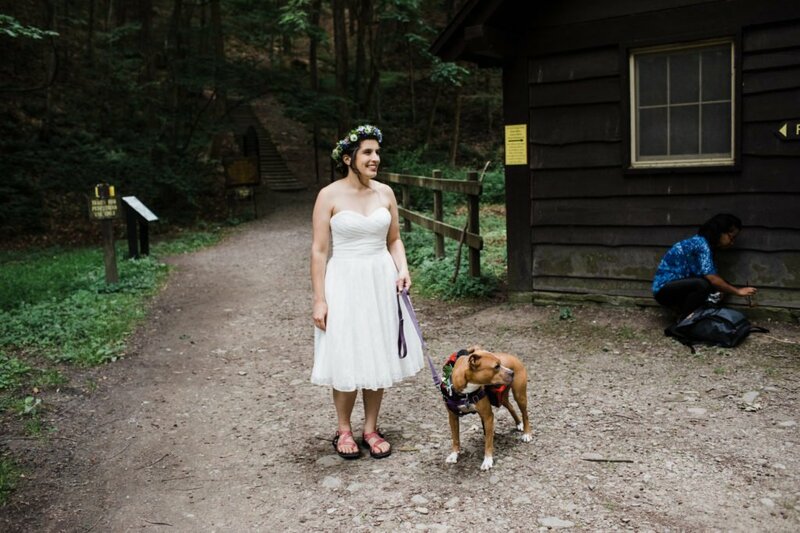 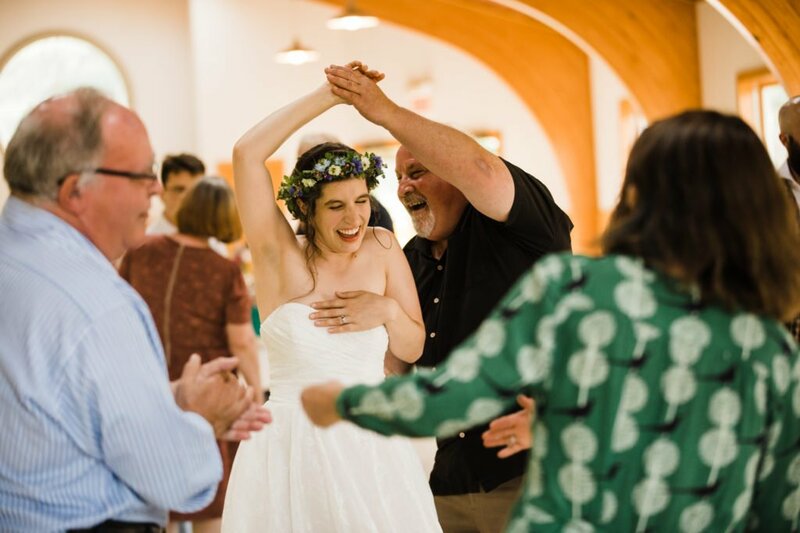 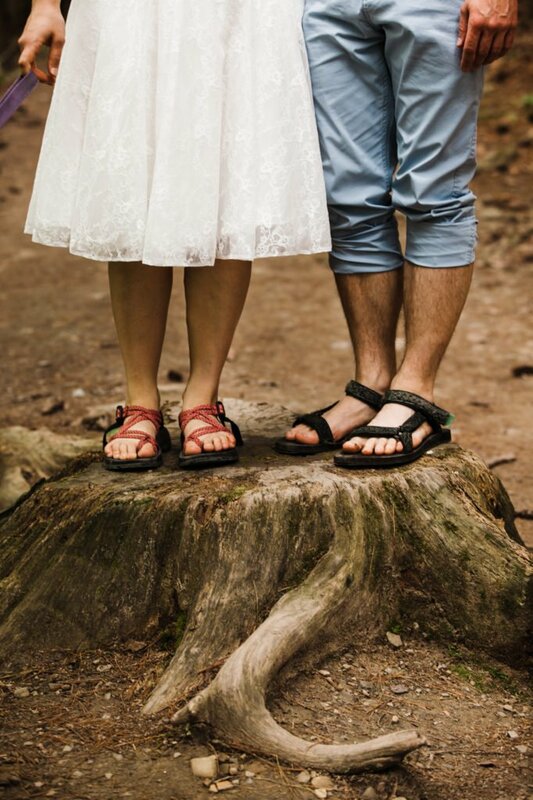 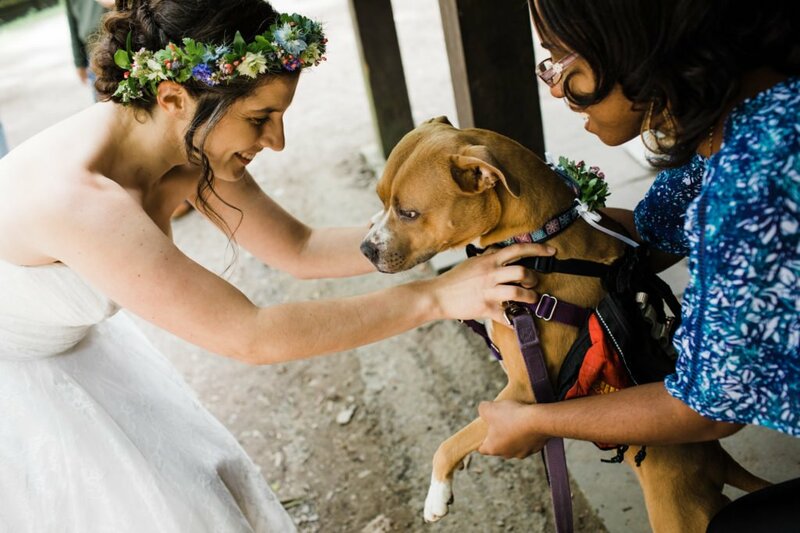 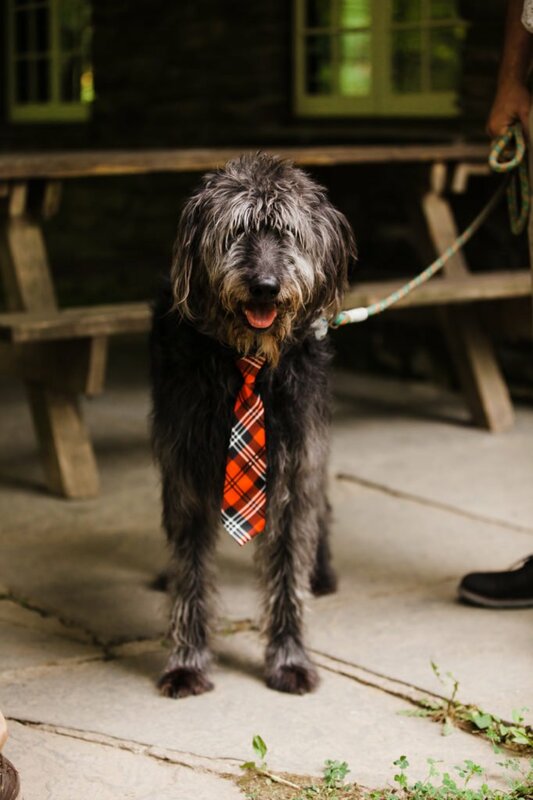 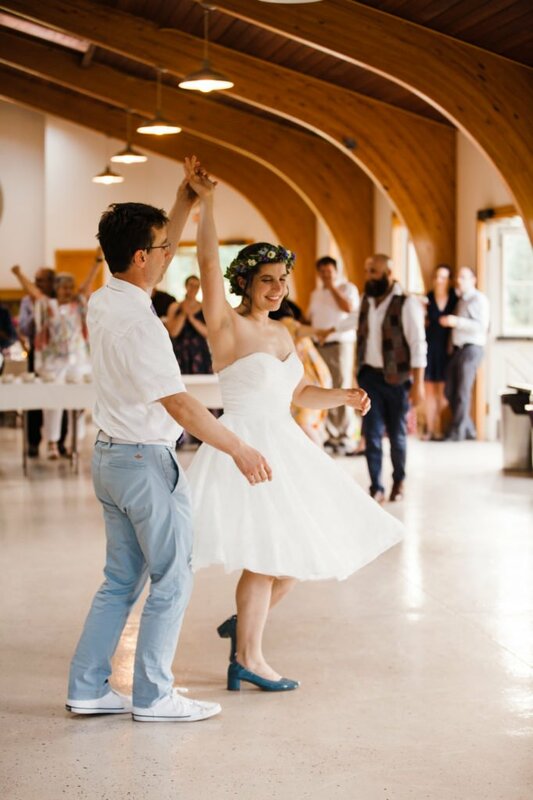 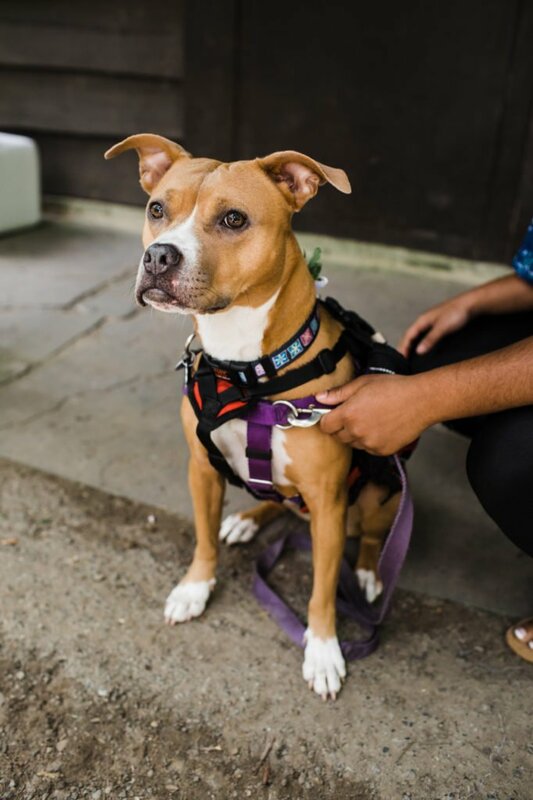 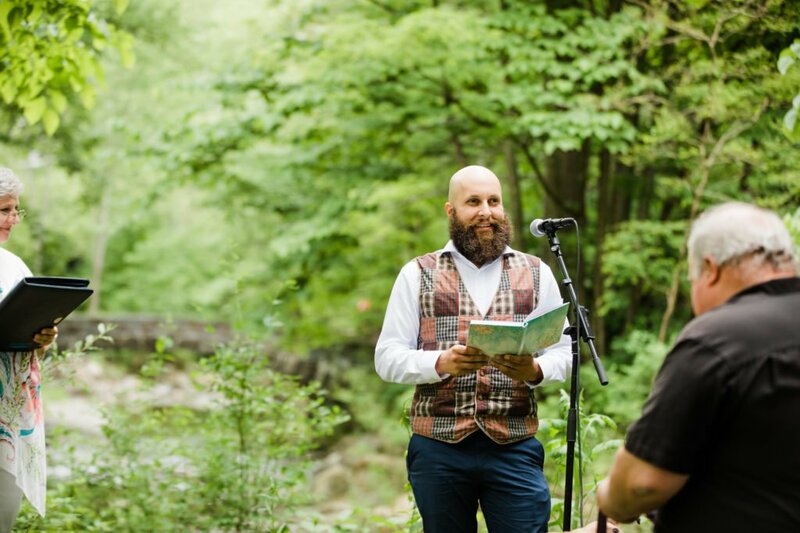 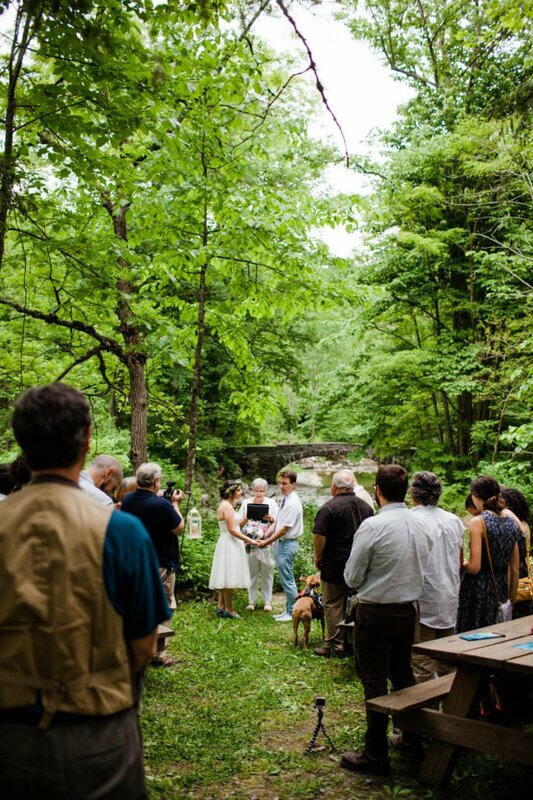 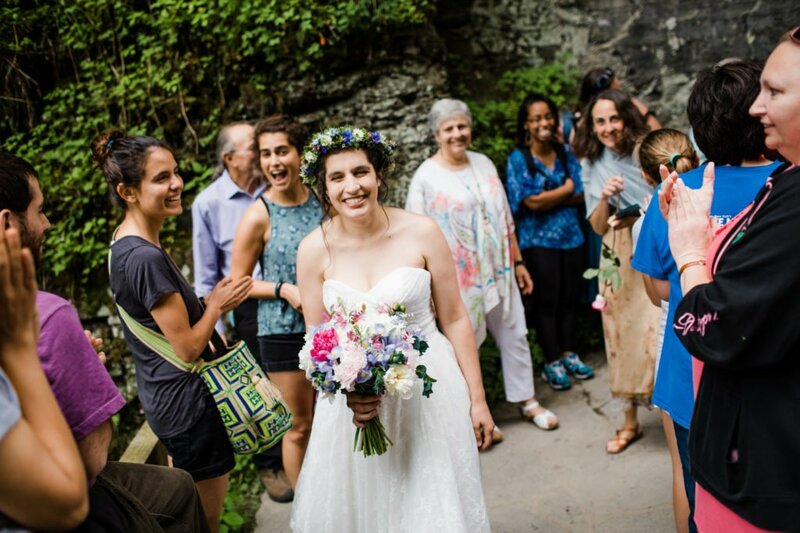 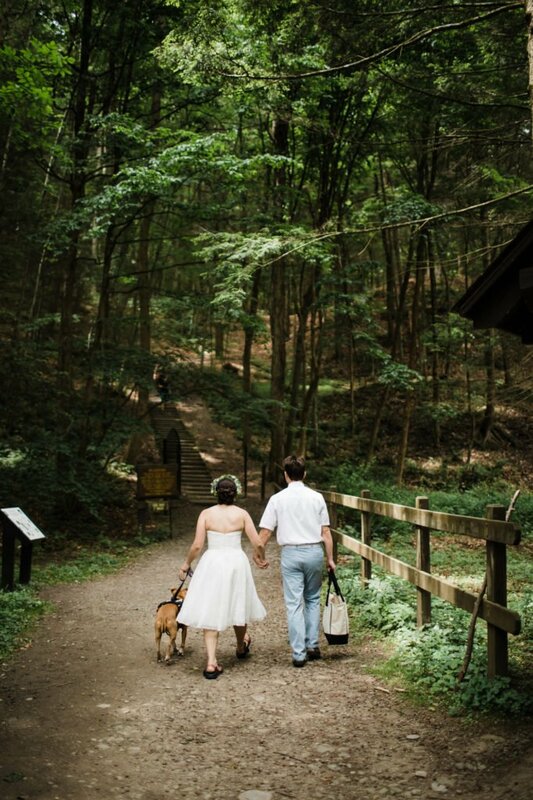 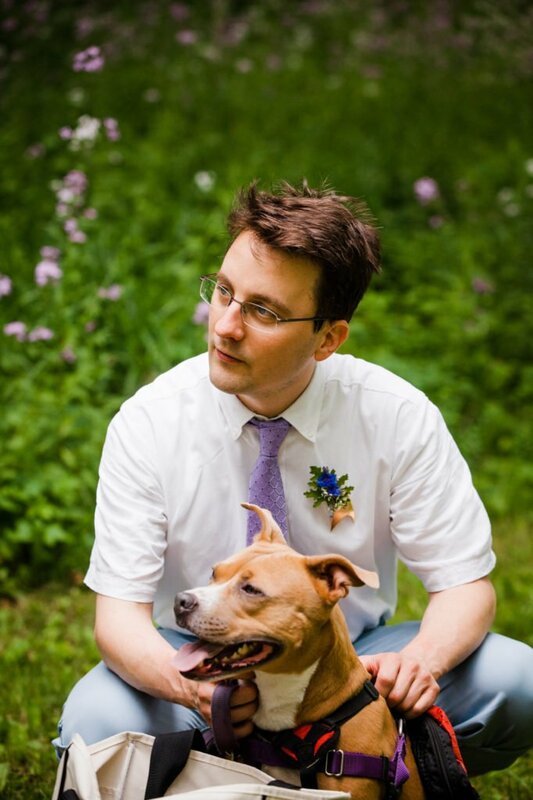 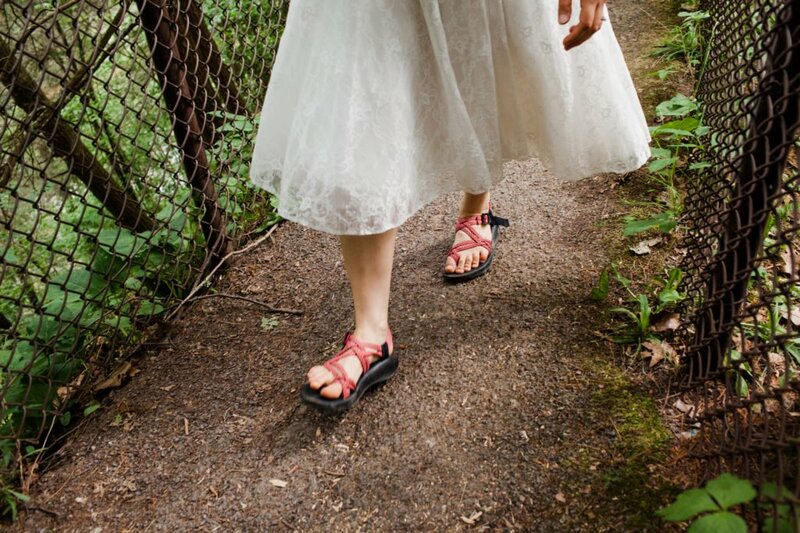 After getting ready in their cabin, Emily and Matt took a private hike (with their dog Anya, of course) up to their ceremony location at the Upper Treman shelter. 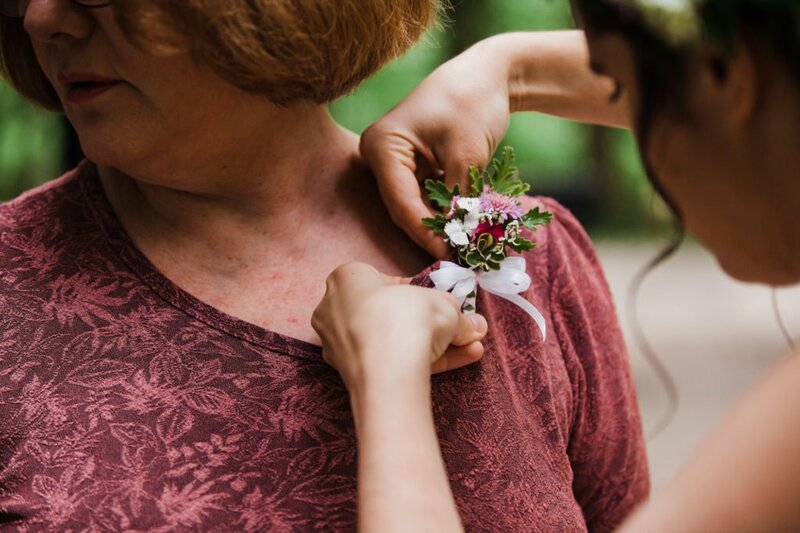 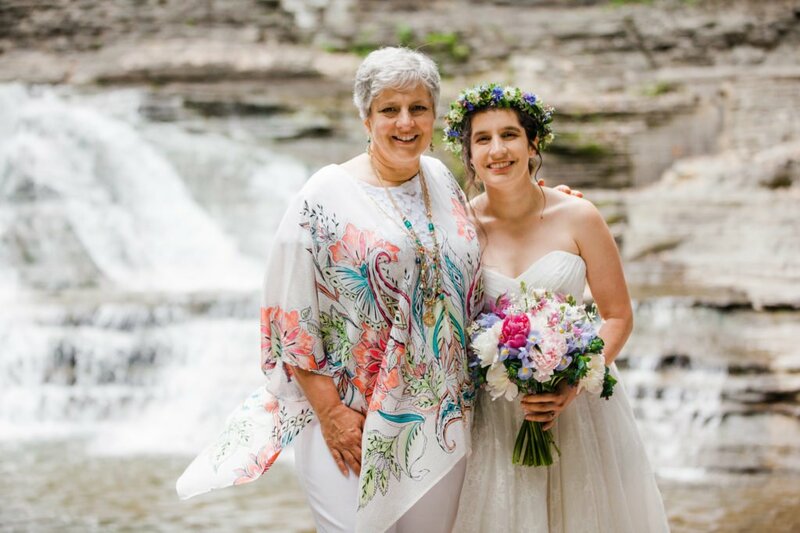 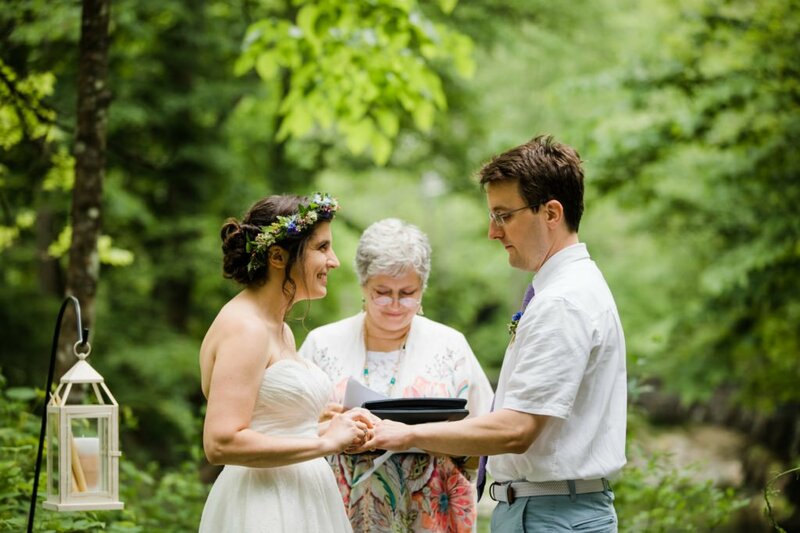 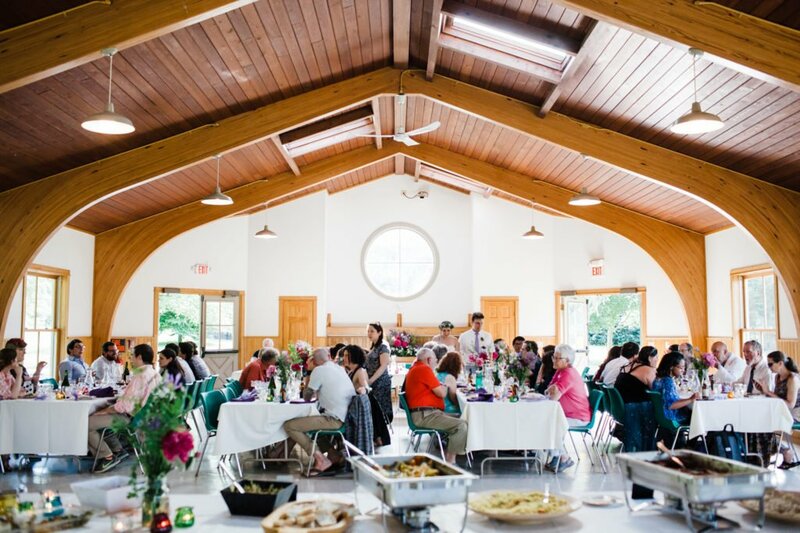 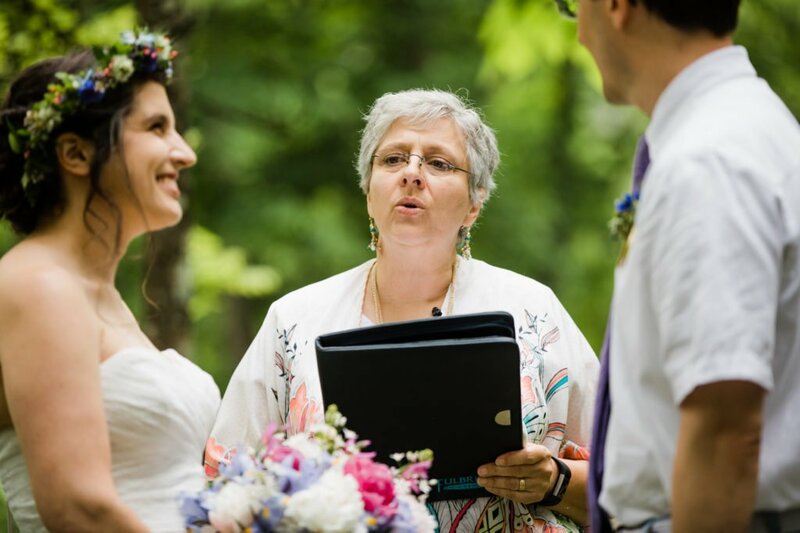 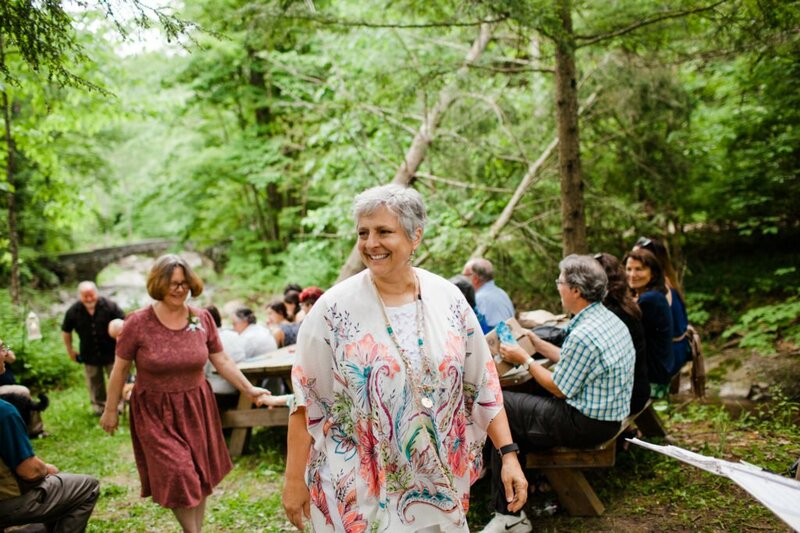 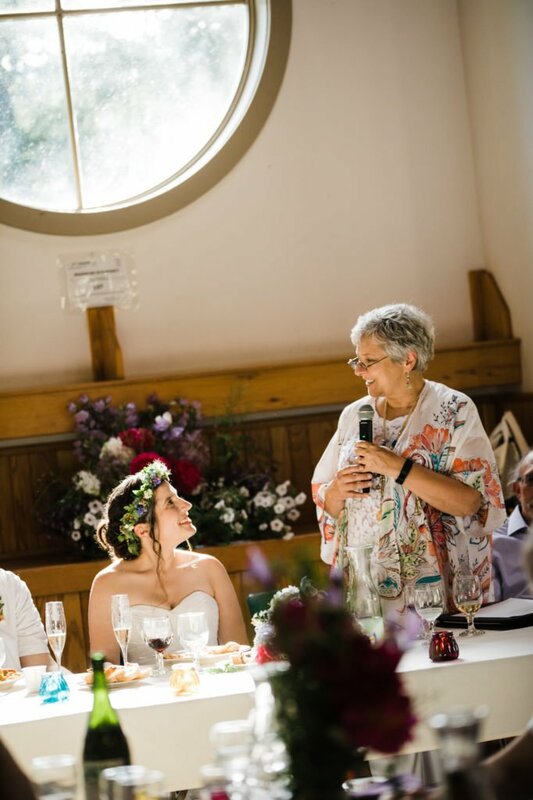 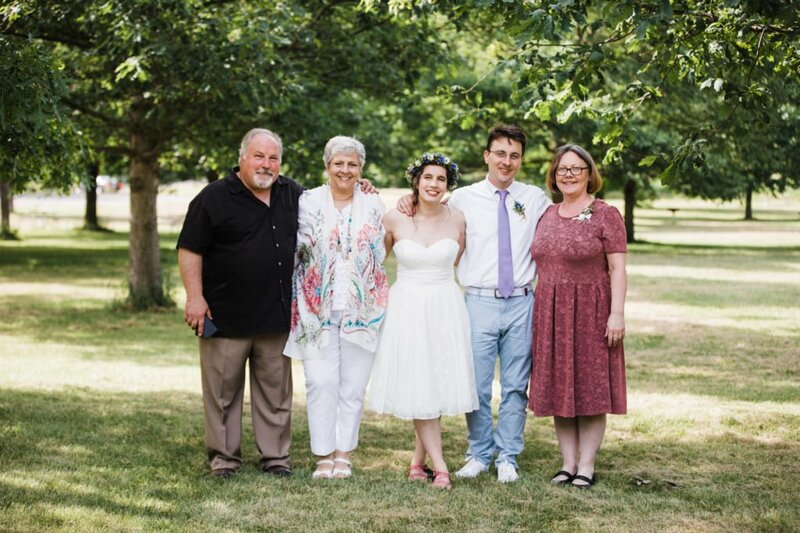 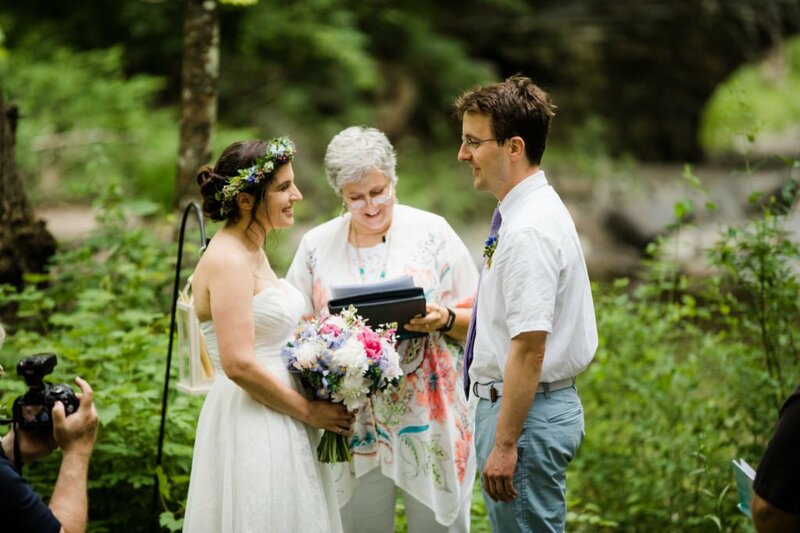 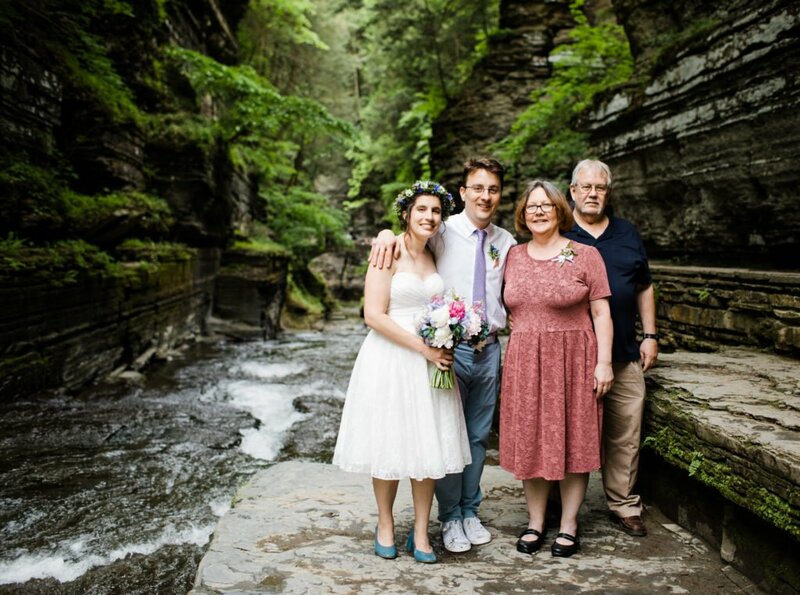 Emily’s mom officiated their ceremony under the June foliage and surrounded by the trickling streams near the upper pavilion, then many of the guests joined Emily & Matt for a hike down to their reception at the lower pavilion. 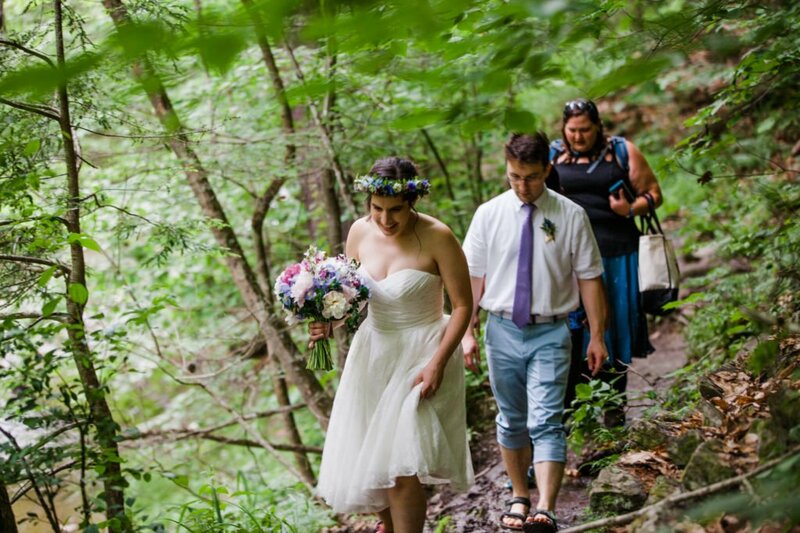 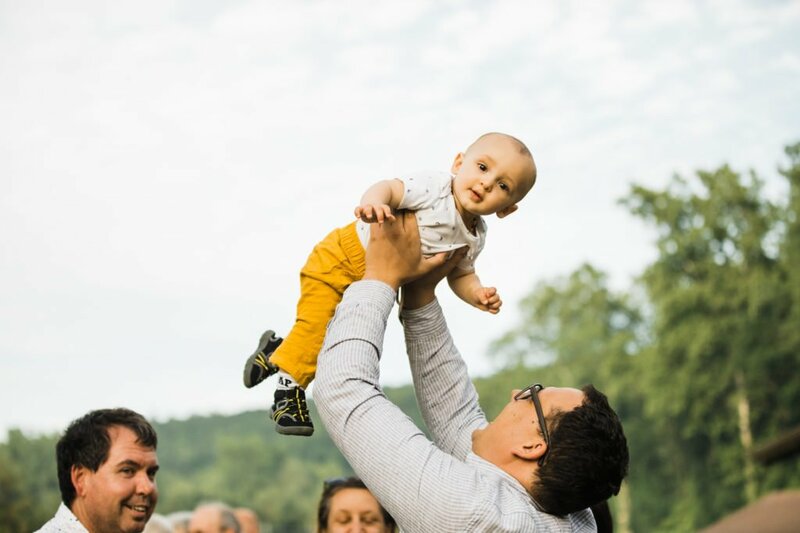 The hike was one of my favorite moments of this celebration– it felt like such an important part of their story, the apex of a day focused on nature, celebration, family, and fun. 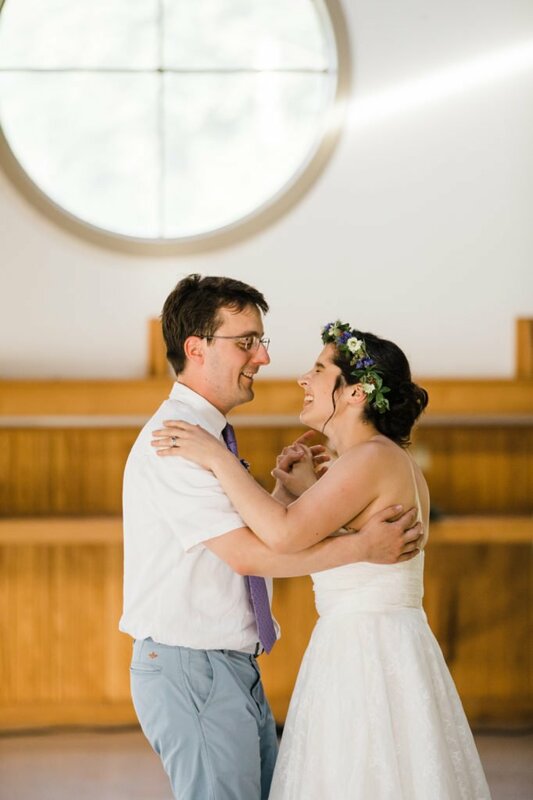 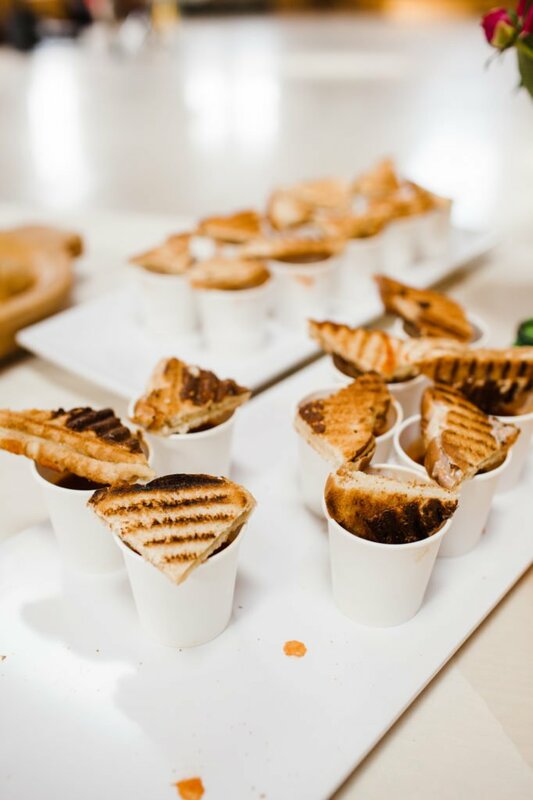 There were so many small moments and details that weren’t flashy but made up the important and memorable story of their day… from Emily’s flower crown to their shoe changes to the cheese toasties (one of Matt’s favorite foods) during cocktail hour. 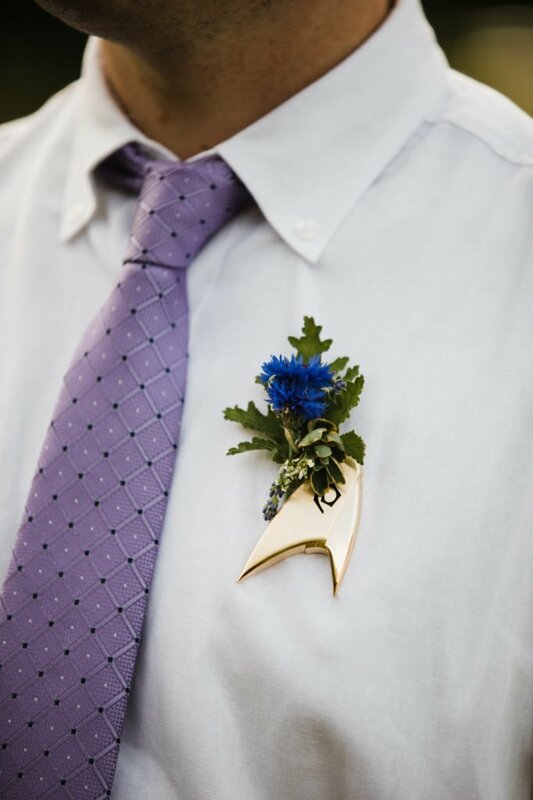 And Matt’s star trek badge boutonniere is everything awesome. 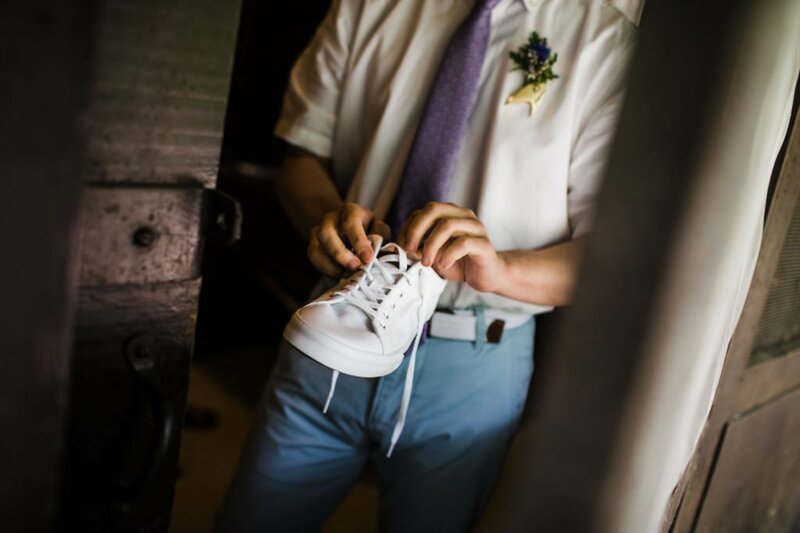 Not only was it just perfect for Matt, but it was a magnet… which helped us avoid the “does anyone know how to put these things on?” moment! 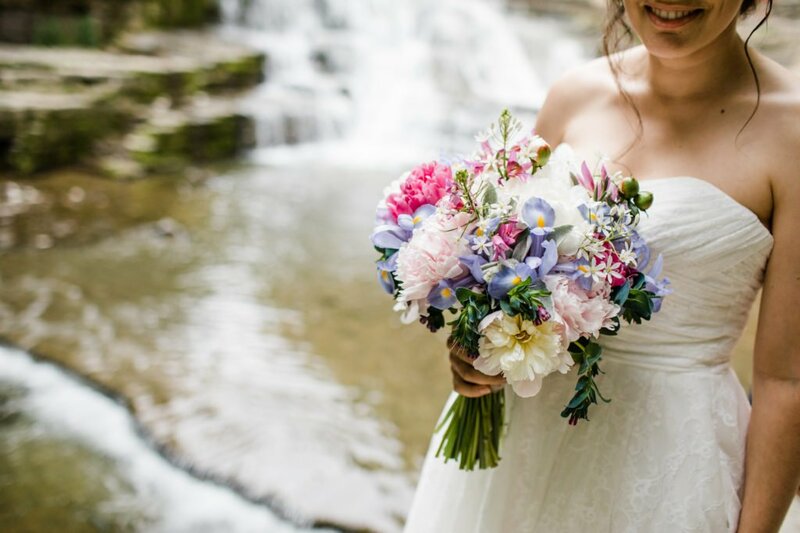 Credit to Take Your Pick Flowers for this awesomeness! 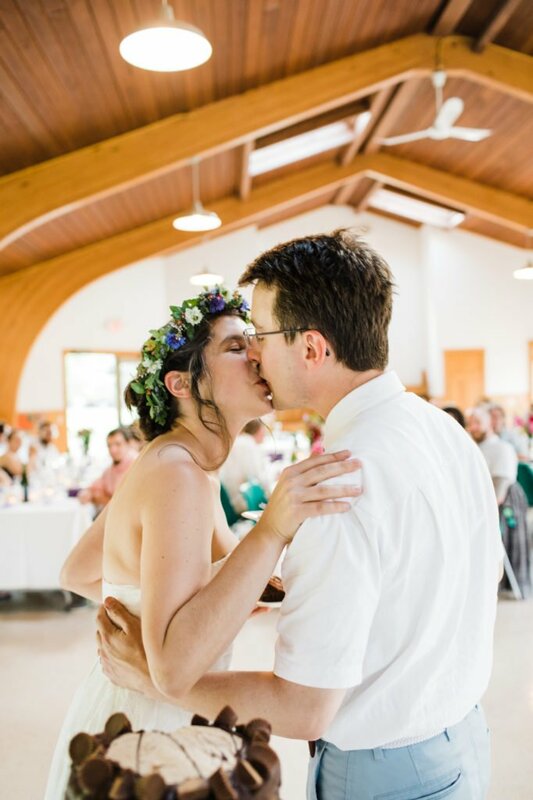 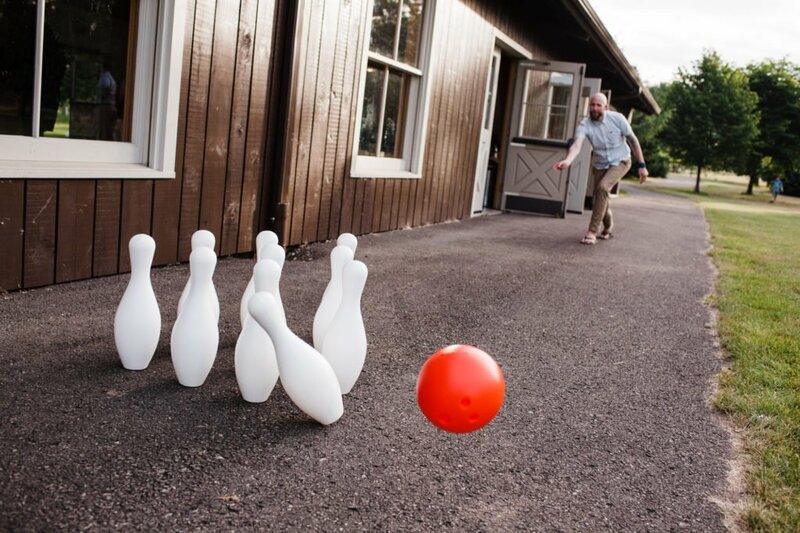 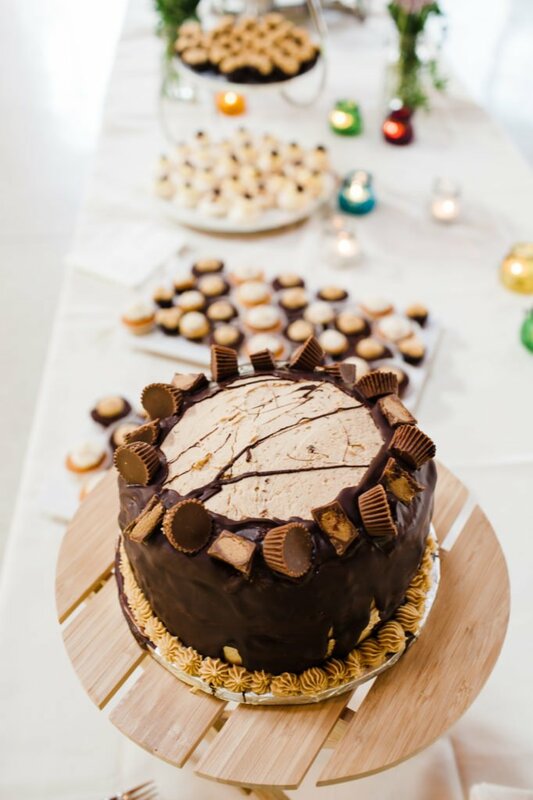 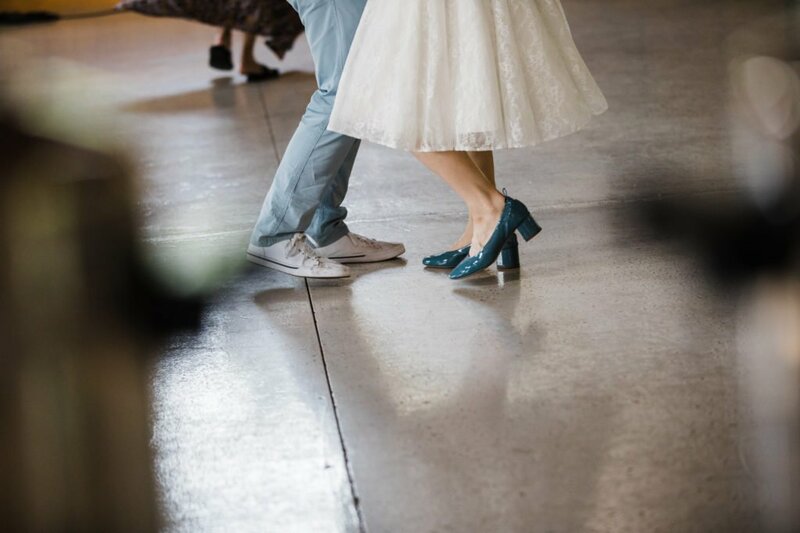 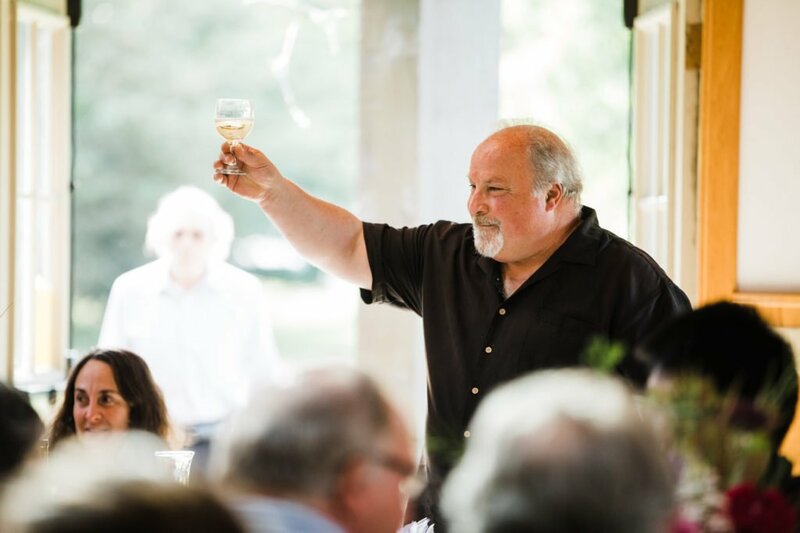 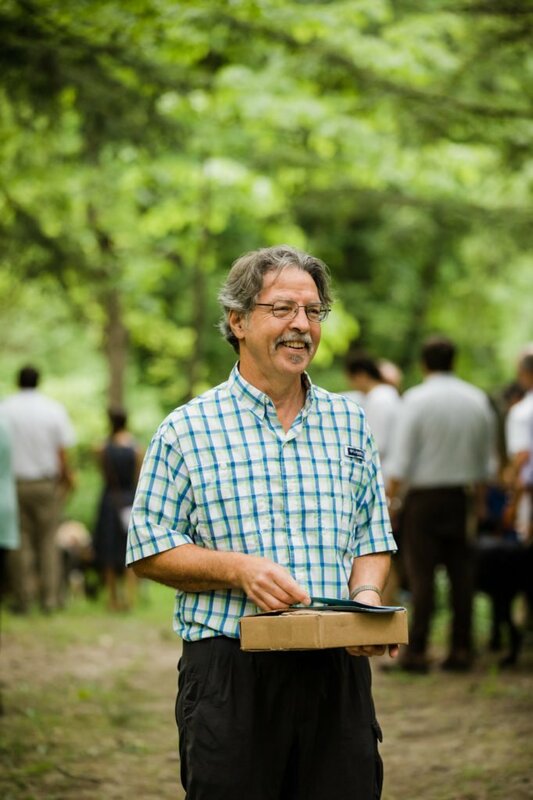 With a small list of vendors, the simplicity of this celebration was perfect. 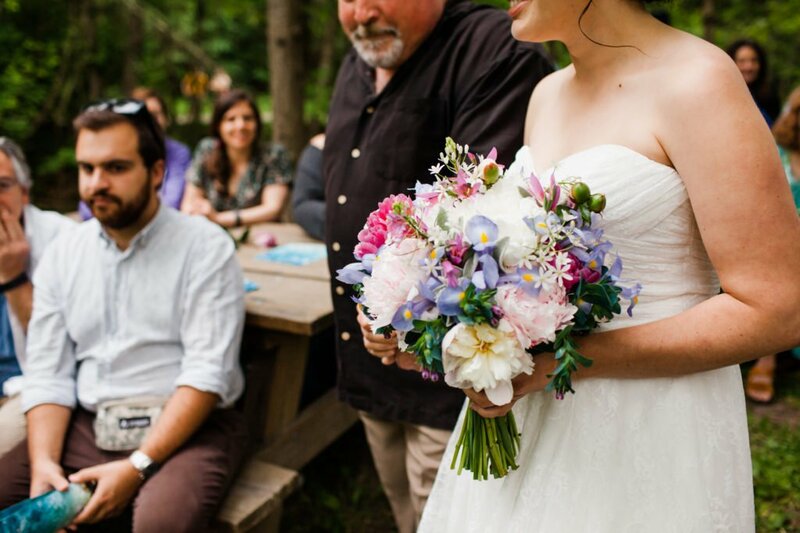 Thanks to many of these vendors for being members of the Sweet Bough Wedding Collective!